Phytosterols are substances that are similar in structure to cholesterol and are formed exclusively in plants. They are added to food for their blood cholesterol-lowering properties. There are numerous commercial products, both raw materials and finished products, containing phytosterols in different proportions. The phytosterols market is projected to exhibit a growth of 8.7% for the next five years. As assessed, the growth of this market is to be propelled by significant health benefits, increasing end-use applications, and government promotions regarding the consumption of phytosterols. However, ill-effects of phytosterols are a major factor hindering the growth of this market. The global market, in terms of value, is projected to reach $721.26 Million by 2020, at a CAGR of 8.7% from 2015 to 2020. The market of phytosterols is projected to grow significantly for the next five years in almost all parts of the world, especially in European and North American countries. The government interventions and regulatory approvals exposed the European market to various advantages of phytosterols. High rate of adoption of phytosterols by manufacturers drives the European market to grow at a healthy CAGR of 9.1% from 2015 to 2020. The global market is highly fragmented with the key market players driving the growth with agreements, expansions, acquisitions, and new product launches to gain presence in the phytosterols market. The market is competitive with leading players being involved in the research & development of new products and new applications of phytosterols. The phytosterol industry has many players (small, medium, and large); however, the industry is dominated by a few. Raisio Plc. (Finland), Bunge Limited (U.S.), and BASF SE (Germany) collectively account for around 50.8% of the total phytosterol market. Acquisitions were found to be the most preferred growth strategy in the phytosterol market. The purpose of adopting this strategy is that it results in increasing geographic presence, clientele, and product portfolio. Other players such as ADM (U.S.), Cargill Inc. (U.S.), DuPont (U.S.), Arboris, LLC (U.S.), Gustav Parmentier GmbH (Germany), HyPhyto Inc. (U.S.), and Pharmachem Laboratories, Inc. (U.S.) also have a strong presence in the market. This report estimates the market size of the global phytosterols market in terms of value ($million). In this report, the market is broadly segmented based on type, application, and region. Market drivers, restraints, and challenges, raw material, and product price trends are discussed in detail. In addition, market share, by participant, for the overall market is discussed in detail. The global market has grown exponentially in the last few years and this growth is expected to continue. Factors such as high efficiency with use in functional foods and rise in health concerns are driving the market for phytosterols, globally. Phytosterols are defined as plant stanols & sterols and are found in the fatty tissues of plants. Phytosterols cannot be synthesized by humans and animals and hence need to be included in the diet. Phytosterols have a chemical structure similar to cholesterol (except for the addition of one ethyl or methyl group); however, the absorption of phytosterols in humans is much lesser that that of cholesterol. Phytosterols are naturally found in all items of plant origin, mainly oils, but also in dried fruits and pulses. They are widely used as food additives in food and beverages, such as yogurt, milk, sausages, cold cuts, bakery products, spicy sausages, margarines, and spreads. This market is projected to grow significantly for the next five years in almost all parts of the world, especially in European and North American countries. 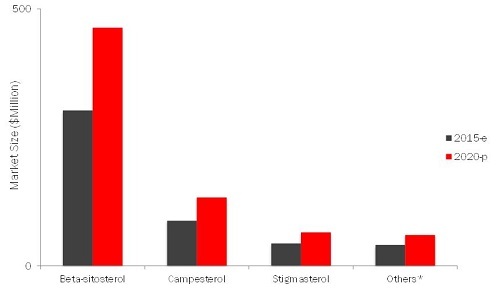 Significant increase in the incidences of deaths caused due to cardiovascular diseases is one of the major driving factors for the phytosterols market, globally. The rise in aging population and increased awareness level regarding health & wellness are also contributing to the market growth. Phytosterols have been given the GRAS (Generally Recognized As Safe) status in the U.S., followed by an approval from the FDA and later by the EU Scientific Committee on Food (SFC). The global market is projected to grow $721.26 Million by 2020, at a CAGR of 8.7% between 2015 and 2020. The market was dominated by Europe, which accounted for around 38% of the total share in 2014. 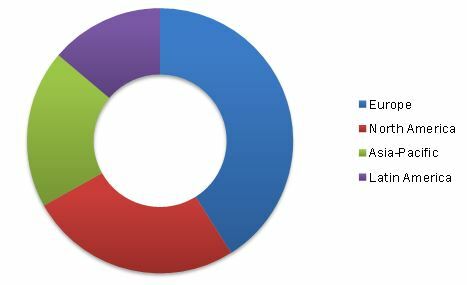 Regulatory approvals from the EU, increasing incidences of cardiovascular diseases, and the rising aging population are the major driving factors for the growth of the phytosterols market in Europe for the next five years. Germany was the largest market in the Europe. The various health benefits of phytosterols are projected to drive its market globally. Their increasing end-use applications and increasing awareness level regarding health & wellness are the driving factors of this market, globally. The global market is marked with intense competition due to the presence of a large number of both, big and small firms. New product launches, mergers & acquisitions, and partnerships & expansions are the key strategies adopted by market players to ensure their growth in the market. The market is dominated by players, such as Bunge Limited (U.S.), BASF SE (Germany), Pharmachem Laboratories Inc. (U.S.), E. I. du Pont de Nemours and Company (Germany), and Raisio Plc. (Finland). 9.2 Benecol - Raisio Plc. 9.3 Reducol - Pharmachem Laboratories Inc. Figure 6 Examples Of Functional Foods In The U.S.